To prevent your Drupal 7 website editors from deleting content, under certain conditions, is not that difficult if you know the proper Drupal hooks to use. However, finding those hooks isn't easy and we're sharing this blog post with you in the hope that it will save you a few programming headaches. If you're a Drupal beginner wondering what hooks are, don't fret, and check out this excellent post on Drupal Answers with a really neat explanation of the basic concept behind Drupal hooks. How to Implement Drupal Hooks? Drupal hooks are implemented inside custom modules. Check out this decent guide to writing your first module in Drupal 7 that we have just finished writing. Let's say you're using Entity Reference and you have referenced nodes from the current node a user is trying to delete. The deletion of this node might leave your website in an invalid state. Another example would be if you're using a standard Drupal menu, like the default main menu, in your website and the node to be deleted has sub menu items and you don't want to mess up with the menu's hierarchy, especially if you're using pathauto to generate your URLs based on the menu's tree structure. Building a solid Drupal website requires adaptation to your client's business requirements and implementing extra features and performing extra checks on top of Drupal's standard ones is a strong step in this direction. 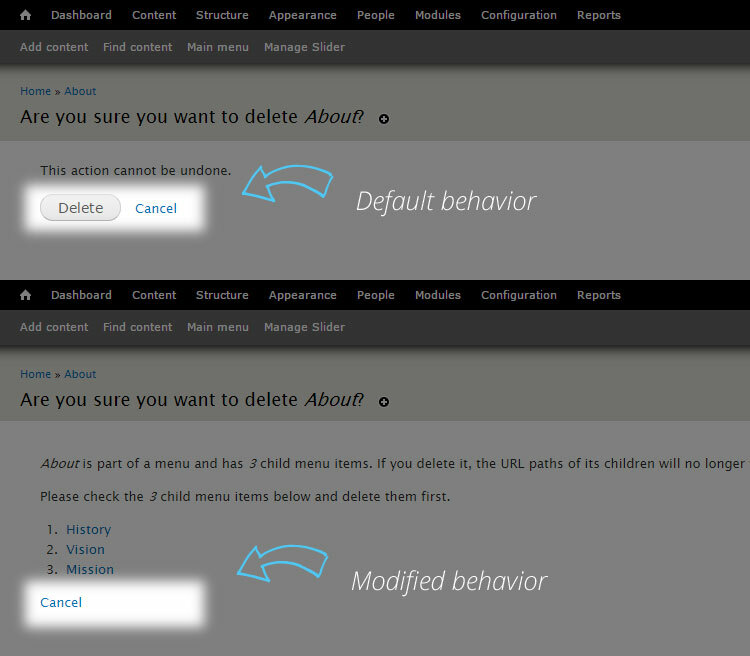 Next, we explore the code you can use to disable access to the deletion of a Drupal node. This function was written and tested in Drupal 7 using hooks inside a custom module. Its purpose it to check whether the current node has child menu items and then prevent deletion of this node and also show a message explaining the situation. We use a function from our previous blog post to get all menu children of this current node path. Read the comments in the function below for more info. In addition, check out the documentation of hook_form_FORM_ID_alter as it's your window to modifying a lot of the Drupal forms presented in the admin area. All you have to do is get the form's id from the admin backend, using Firebug for example, and modify the hook's function name accordingly to modify the form you need. Our function's name below serves as an example. Modify and tinker according to your needs. * Implements hook_form_FORM_ID_alter() to conditionally prevent node deletion. * or move them to another parent menu item. * the child items being derived from their parent item path, for example. //so that this node cannot be deleted by the user. //needs, this is adequate as we trust the editors on our websites.